The personable former president of the Bristol sports network has been a guest speaker at many gatherings since leaving ESPN. His book signing events have attracted large crowds probably since Bodenheimer has been out of the business and limelight for some time and has interesting tidbits to offer. The Bodenheimer became president of ESPN in 1998, 19 years after we first met at my former sports lounge in 1978 when he was a mere mail room employee. His leadership was so valued he was among the top sports executive in the country and returned as chairman in 2017 after John Skipper resigned. I bought his book recently because all the proceeds will go to the Jimmy V Cancer Foundation. That foundation is prompted by ESPN in honor of the cancer-stricken basketball coach, Jimmy Valvano, who died after his final appearance at the network’s ESPY event. I also met the late Valvano among other ESPN notables since the network began broadcasting a year after my Hall of Fame opened. Bodenheimer was initially hired for $8,300 a year in 1979. His net worth today is reportedly $25 million. Sound too good to be true? At a speaking engagement at the gorgeous Rosa Gatti conference room at the Bristol Boys/Girls Club named after the former network’s sports information director, Bodenheimer spread the credit to dozens for ESPN’s success. His book outlines the early struggles of a cable network that became concerned after several years of existence about viewers accepting a 24-hour barrage of sports. From 1998 to 2012, Bodenheimer became president and established a sensible approach to success. He had a vision but was open-minded to accept the observations of young but talented executives hired over his tenure. Bodenheimer brought ESPN as Bristol’s leading taxpayer and notoriety by going from 39 to 116 acres; eight to 18 buildings and from 260,000 square feet to 1.3 million. Today, ESPN is a global giant sitting across the road from Lake Compounce but boasting a “dish farm” on Southington land that exposes dozens of satellite dishes. Even a minor issue about making sure the network could aptly feed its employees in better fashion than previously drew Bodenheimer to create a formal cafeteria that hosts workers and the horde of celebrities who visit the campus. Unfortunately since 9/11, it is extremely difficult to drive up to the front gate, ask to visit the gift store or tour the huge production and studios. Security issues and federal concerns about having a network pool that could be shattered at the traditional networks, upgraded ESPN to a serious and national voice in the event of a tragic terrorist attack. While Bristol is known as being the headquarters of ESPN, visited by celebrities who had never heard of the city, it also is the home of a 40,000 square foot Boys and Girls Club that, in less than two years, has attracted over 600 young members. The facility is spotless, welcoming and a tribute to the numerous donations years ago by those who saw the need to give Bristol a physical destination for youngsters who can grow up to be happy, smart, friendly and create motivations to succeed. 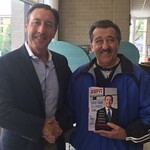 To this columnist, George Bodenheimer will just be an old friend whom I met in 1979 during late hours at my former sports lounge about a mile south of ESPN. It was ironic that I was drawn to his personality despite having ESPN celebs attached to the bar while Bodenheimer and a few colleagues settled in at nearby tables. George was hardly a celebrity at that time when Bob Ley, Chris Berman, Tom Mees, Robin Roberts, Chris Myers, Dan Patrick were headliners down the street where empty truck trailers, a muddy field and small buildings were the visible pieces of a soon-to-be television sports dynasty. ESPN was my best client in those days and I would cater to their late night crew even when it was far beyond established hours. ESPN and Connecticut’s first sports bar/lounge were logical friends in those days. However, it was quite different from today’s arena of sports reporting. The luxurious Cava Restaurant on West Street has become a favorite of ESPN executives but very few ESPN personalities have individual star status and that’s what Bodenheimer’s era provided. Bodenheimer’s book is worth reading, especially if you are a loyal ESPN viewer. Posted in New Britain Herald, Southington Herald on Wednesday, 5 September 2018 20:11. Updated: Wednesday, 5 September 2018 20:14.